You had me at pie. 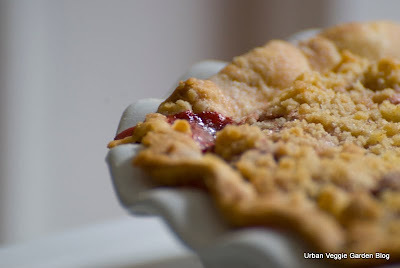 I so love pie (all except cherry) and strawberry rhubarb is one that brings up the nostalgia of childhood. My mom wasn't a great cook, but she could make pie and every spring we got strawberry rhubarb. Yum! That and fresh cantaloupes were the real treats of summer. Now you are such a big tease with that pie-we just can't eat it thru the computer! Darn! Daphne - Until recently I had never had strawberry rhubarb pie. I remember a good amount of rhubarb pies when I was younger though. The added strawberries really add to the pie! Miss M - The pie plate is a new addition, it came from home hardware, 10 bucks I believe. Schnitzel!!! Oh my goodness I haven't had that since I was a kid. What's rhubarb like? Prue - I try not to eat much white bread but this stuff is irresistible. Buttermilk bread with sesame topping baked locally, soft chewy, amazing! Some times I wonder how I don't weight 250lbs, ha. Ribbit - I get Schnitzel from the store pretty often. I like that I can cook it from frozen to cooked in 15 minutes. Rhubarb almost has a strawberry taste but it is really sour, it needs lots of sugar. Okay... I have got to quit reading these garden meal posts late in the evening.... I end up prowling the kitchen for a snack afterwards because they make me hungry! LOL! 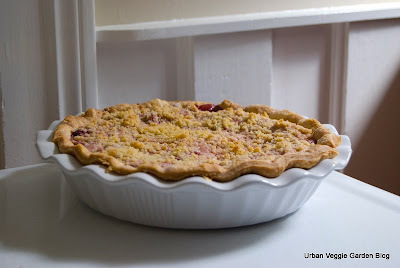 Rhubarb and strawberry/rhubarb pie is one of my absolute favorites. Such a treat and so appealing to look at. kitsapFG - I'm a big pie fan, anything sweet actually! By the way when I try to comment on your current post it will not show up. I've never had strawberries and rhubarb together. Somehow I feel it will detract from both but maybe I'm wrong - it looks like it might be greater than the sum of its parts. Although I've never had rhubarb pie, it looks absolutely delicious! Dan - Come on man! I need a pic of the tomato salad!